This here tutorial is part 1 of 3 in a series. 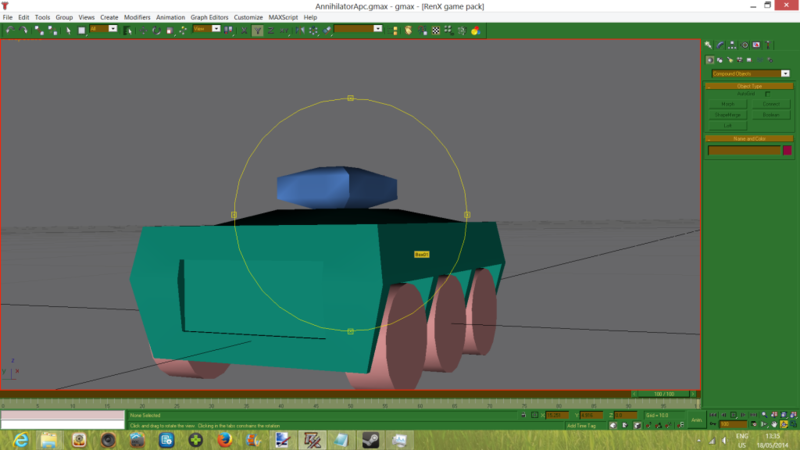 This series will teach you how to model and bone vehicles in RenX and also how to set-up a multi-turret vehicle. This first part is all about modeling vehicles. To bone a vehicle later on, you obviously first need to have a model to work on. Which is why we start here. In this first part of the tutorial we will be making these models from scratch. It helps to have a mental image of what you are trying to create, though you can of course just 'go-with-the-flow' while modelling. If you already have a model and only want to know how to bone, skip this first part. Now the order in which you model your vehicle does not matter at all. You can first make the turret and work your way down, or you can start with the wheels and work your way up, or, well you can start anywhere and end with any part of the vehicle. 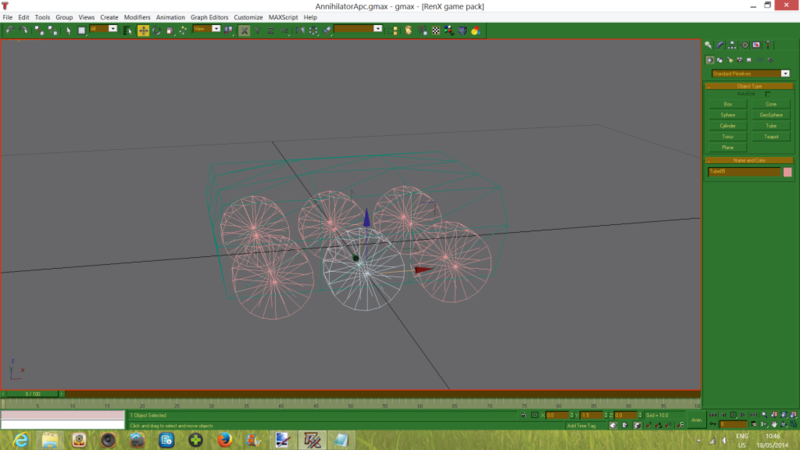 My preferred method of moddeling is to start with the wheels and work my way up though. While you are in the modelling phase the names of the objects do not yet matter. 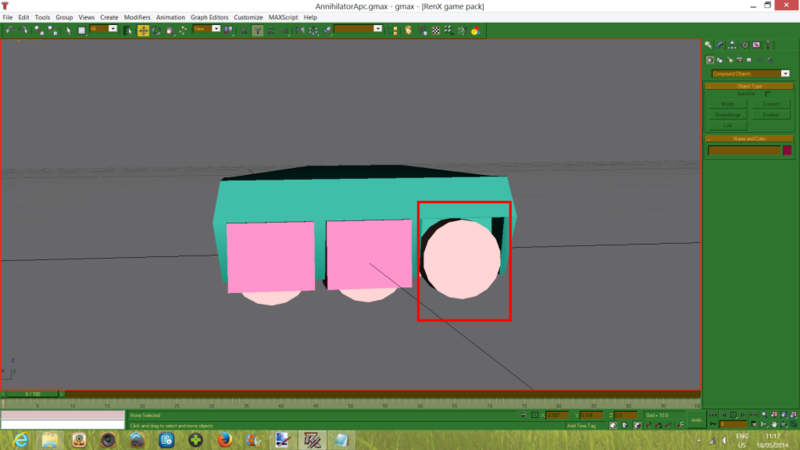 It is kind of hard to help you with whatever vehicle you want to model since what you might want to model might require something I do not use in this tutorial. Nevertheless I will try to cover as much of the basic stuff as possible. 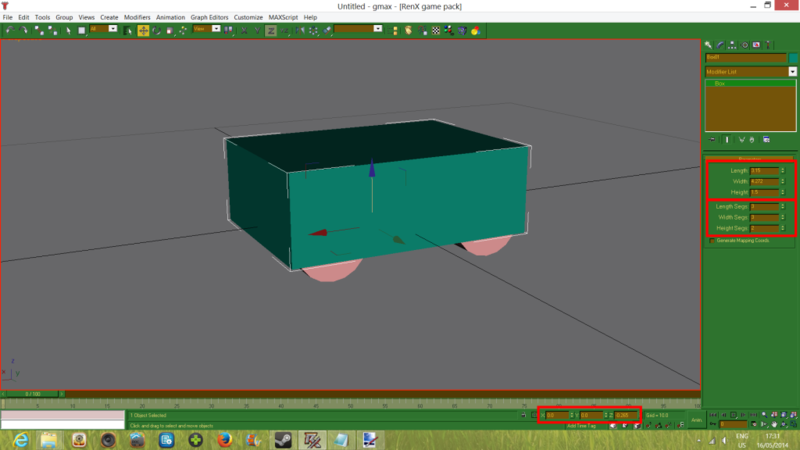 This tutorial will use a vehicle I have made as example. Now below is my fully modeled and boned vehicle (yes the wheels are a bit low on this screenie :3). This will be the only screenie I will actually show here. The rest of the screenies for the tutorial will all be links (to save on loading times for this page as well as keeping the post smaller). To follow this tutorial you will need RenX as well as paint.net (or any other image editor which allows you to save as .TGA). It helps to be familiar with RenX, but I will be trying to be as step by step as possible, so you should be able to follow it if you are a complete newb to Renx (I hope :3). For the sake of saving space and keeping the length of this tutorial down, I will keep the repetition of the steps down though (I will refer to the step instead of describing it in full detail again). These tutorials are already lengthy enough without repeating steps over and over. Now before we create anything I'd recommend switching the lower right square to full screen. To do this click in the square and then click on the button in the bottom right corner of the screen. Let's start by making some wheels. You should be on the geometry tab by default, but if not go to the create tab and then the geometry tab. You can use either cylinders or tubes for wheels, since these are the best shapes to use for wheels. 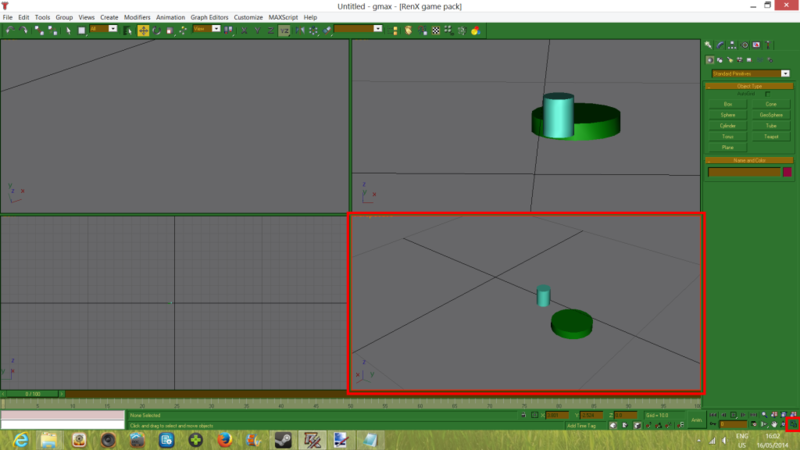 If you want to create a cylinder just click on cylinder and then click and move your mouse, let go of the mouse button, and move your mouse again (in the gray window to the left). For a tube click on tube, click and drag in the gray window, then move your mouse and click and then move your mouse again and click. 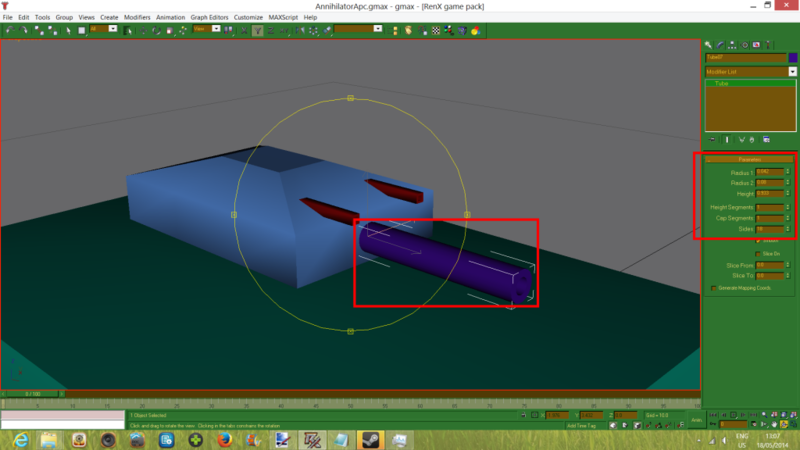 It does not matter yet how big you make your cylinder/tube since you can still edit their size. You should be on the modify tab by default after creating an object, but if not click on the modify tab button (check the highlighted button on the top right in the below screenie). Since this tube will be a wheel, we are going to change the first radius to 0 so that the tube becomes solid (no hole in the middle). Next we are going to rotate the tube by 90 degrees X. To do this click the rotate tool in the toolbar above the gray window. Then click on the x arrow (red) and drag your mouse so that the wheel stands up right. To make sure you got the right angle check the X,Y,Z underneath the gray window. The X should be on either 90.0 or -90.0, depending on which way you dragged the mouse. You can also directly input this value as an alternative for clicking and dragging. The rotate tool will have to be selected for this to work of course. Next we are going to size the wheel further by either reducing or enhancing the radius 2 and the height. For my vehicle I need it to be smaller, so I will be reducing it. Whether you make the wheels bigger or smaller really depends on the vehicle model you have in mind. While we are at it, also make sure the Height and Cap Segments are 1. Increasing these numbers will lead to unnecesary polygons in this case, since the wheels do not need to be incredibly detailed. Leave the sides ammount alone unless you want your wheel to change shape by lowering it, or make the wheel smoother by increasing it. The values in the screenie should be the defaults for the segments and sides. Next we are going to clone the wheel however many times we want (depends on how many wheels you want your vehicle to have). There is undoubtedly a maximum number of wheels you can have, but my multi turret testing vehicle had 8 of them, so up to that ammount is safe at least. is four. You CAN have more if you bone right. More on that in the boning tutorial. but since the names do not matter yet, I personally do not bother yet and just click OK on the suggested name. Notice that you do not see any new shapes in the scene. This is because the cloned object is placed EXACTLY at the position of the original. Also if an original has w3d export settings, and you clone it, the clone will not have these settings. We won't be setting these settings up till much later though, so do not worry (as a general rule try to do all your cloning before setting up export options). Now, provided that you havent clicked anywhere in the scene yet, the clone should still be selected. Click the select and move tool in the toolbar, click on the Y arrow (green one) and click and drag it away from the original.The direction you drag away to depends on where your original is. See those thick black lines? Those are the X and Y lines. Where they converge is exactly 0,0,0 (X: 0. Y: 0. Z: 0.). Depending on which side the original wheel is, move the cloned wheel to the other side. The exact distance from the line does matter, but we will adjust that later. First just keep cloning till you have enough wheels for your desired vehicle. Clone your original wheel first and move it up or down depending on where the original is, then clone the second wheel you made and move that up or down also (X/red arrow). Now, since your vehicle has to be centered around 0,0,0 we will be moving the wheels so the have 0,0,0 as center. First select all your wheels (select and move tool) by selecting 1 wheel and then holding control down and clicking on the other wheels. Move them so that the 0,0,0 point is roughly in the center of all your wheels. Now as you can see on the bottom screenie below the front wheels are now evenly spaced. co-ordinates again. Just copy the Y co-ordinate of whichever wheel is on the front and already placed correctly and paste that in the other wheel on the front. Then next, do the same for the ones behind those. Below screenies show my end result. Next we will make the chassis. Create a box of any size (depending on the look you're going for). The look I am going for is wheels in wheelcages. For this i make sure my wheels disappear into the chassis on the x and y level (they only stick out underneath on the z level). I also centered the box by changing its x,y and z to 0, and then dragged it down a little to make it fit better for this vehicle. 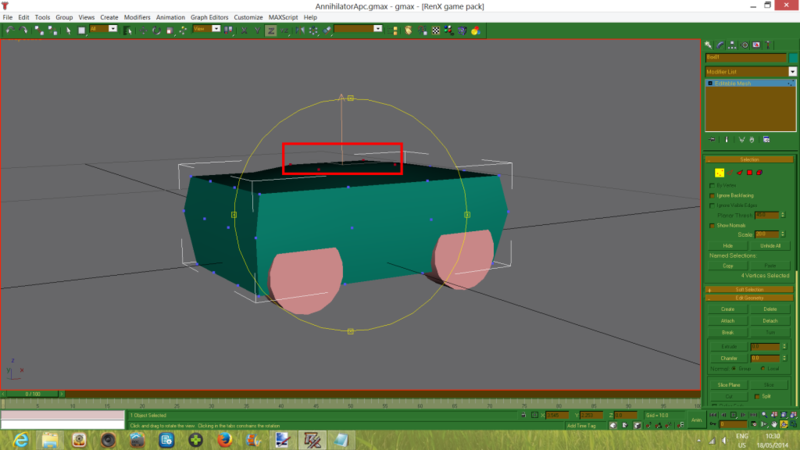 Next lets change the length, width and height segs (segments) to 3,3,2 (the higher these numbers the more detail you can model, BUT this number also equals the extra ammount of polygons your vehicle will get (less polygons = better)) to make our chassis a little less blocky in the next phase. The ammount of segments will vary based on your needs. 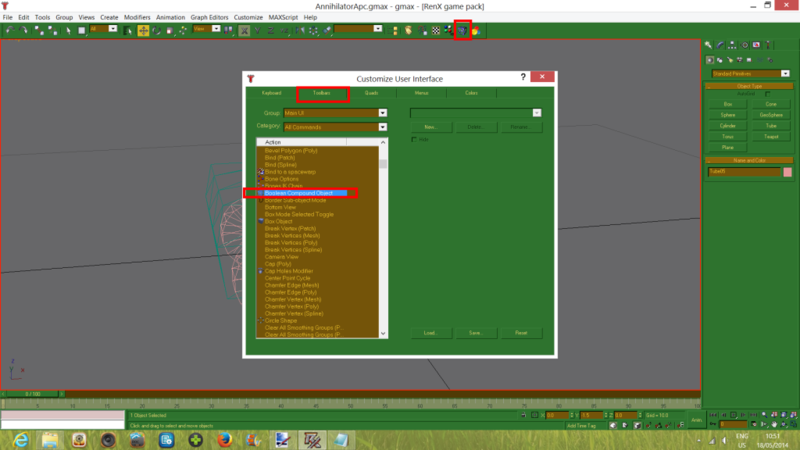 Next select your box, right click and select convert to -> convert to editable mesh. You should be on this menu now, but if not go to the modify tab again. 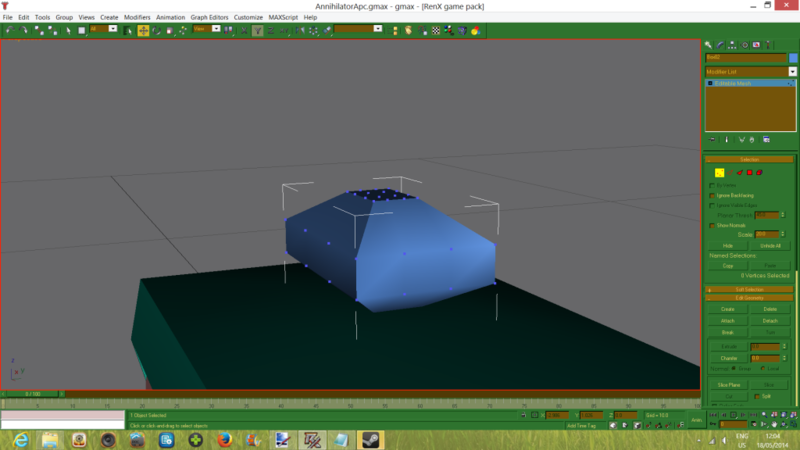 Click on editable mesh and then click on vertex. How you shape the chassis will, again, depend on what you want it to look like. In my case I will first be hightening the middle row of vertexes to go above the wheels. To better see this you are going to want to use wireframe mode (F3 on your keyboard). I just clicked somewhere in the void and dragged a box around the vertexes that make up the middle row. This will do, so leave the modify tab again. Also, if you have not saved your model by now, do so. I reccommend saving regularly. 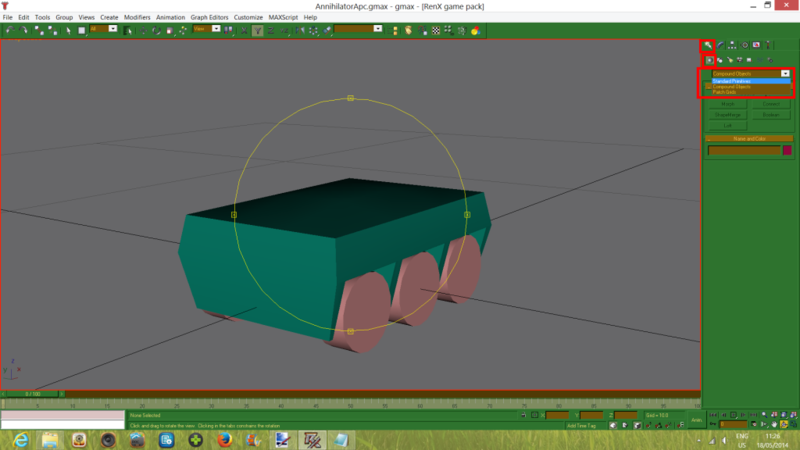 Now, I have reconsidered my ammount of wheels and have decided to add one more pair, making it three wheels on each size. If you also want more wheels, just clone one of your wheels (edit >clone) and move it to the middle of the other two, which in my case is 0.0 on the x axis. Next we will go and make some room for the wheels in the chassis. The easiest way for this is to use boolean. Although it does have the downside of creating unnecesary extra vertexes. If you do not have boolean on your toolbar go to Customize > customize user interface. 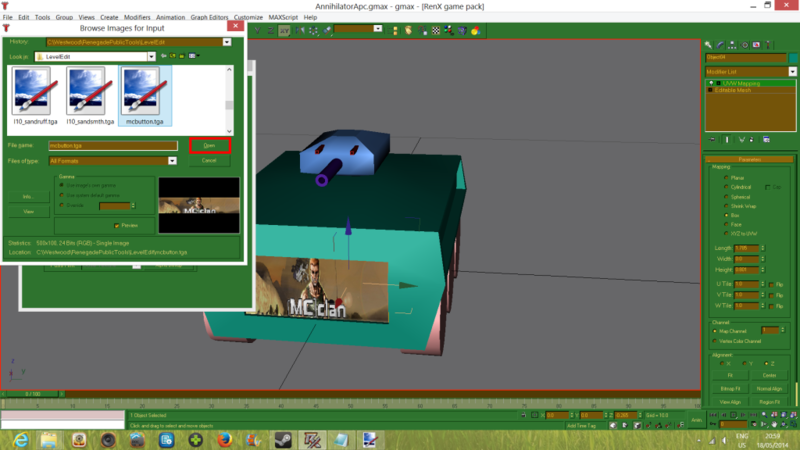 In the pop-up menu click on toolbars and scroll down the list to boolean compound object. Click on it and drag it onto you toolbar. If done correctly you should now see the boolean icon on your toolbar. Now, create a box, position and size it so that it is just a bit bigger than that portion of the wheel which is in the chassis. This will obviously vary depending on the size of your wheels. For mine the below values were good. 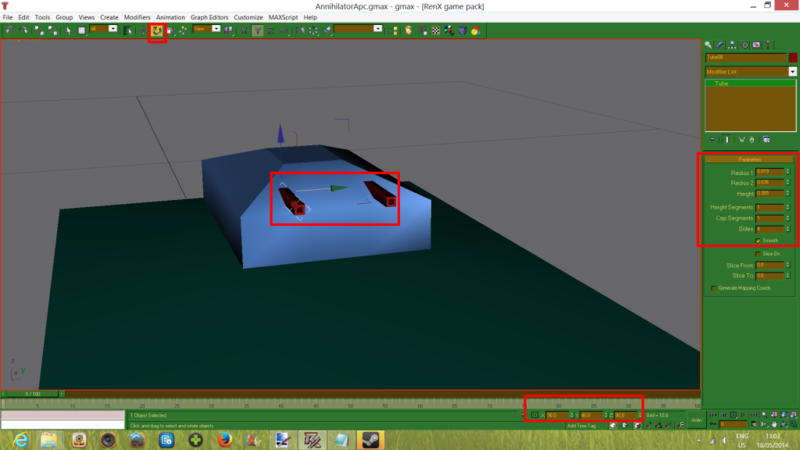 For centering the box you can just copy the x value (or Y value depending on where you made your vehicle so far) and paste them into the box X value. Next, just clone your box enough times and position them over the other wheels. The way I do this is I clone one side first, then select all boxes on that side and clone those and move them to the other side. 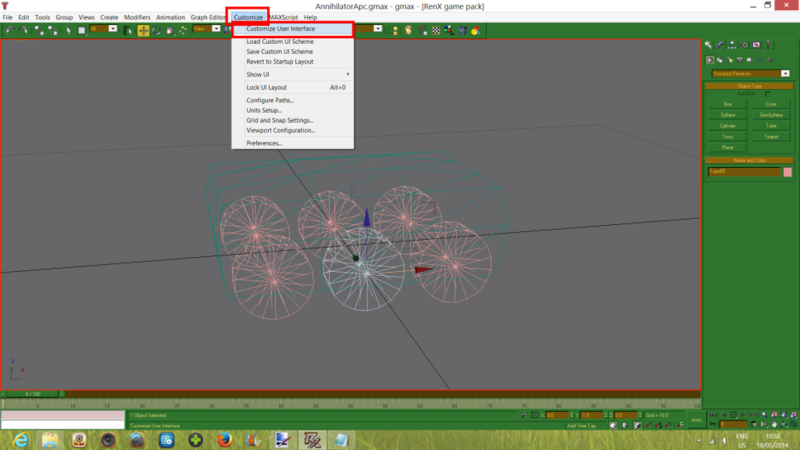 Just copy the x and/or Y values of the wheels again for positioning the boxes. My end result is below. Now to start using boolean. Click on your chassis. Next click on the boolean tool. The menu on the right should change now. Make sure it says Copy at pick boolean, then click on Pick Operand B. Next click on the one of your boxes. Voila. You just used boolean. 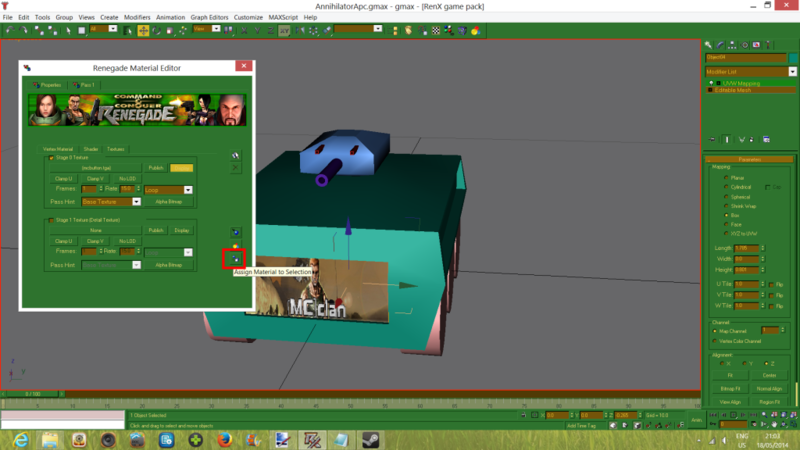 Now click on the select and move tool in the toolbar to regain control of your the scene. Next, select your box (the one you just booleaned) and hit delete on your keyboard. End result in second screenie below. Now, rinse and repeat for your other boxes. End result below. Next we shall be making ourselves a turret. You can use most of the standard primitives for this, depending on the look you are going for. For my GDI heavy tank, which I used to test out the multi turret setup, I used spheres for the turrets. I will probably use spheres again for the additional turrets (or not, I have not decided yet), but for the vehicles main turret I will use a box now. Go to the create and geometry tabs again. It will most likely be on compound objects now, since we used boolean. To change back to standard primitives just click the arrow next to compound objects and change it. 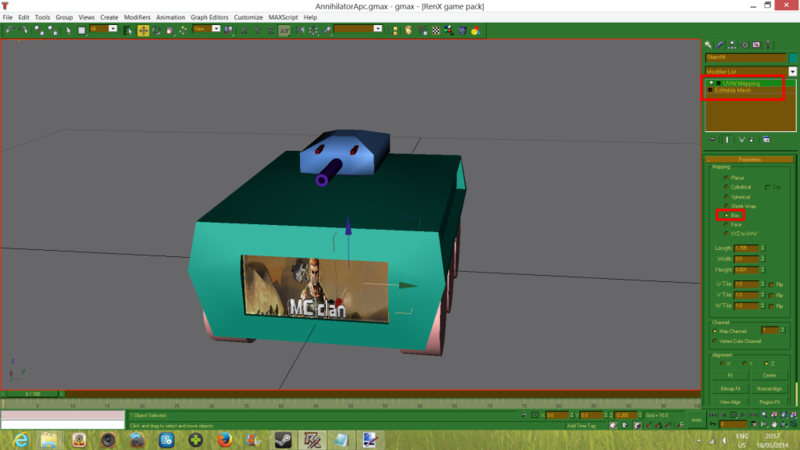 Now create a box again and manouver it to where you are going to make the turret. 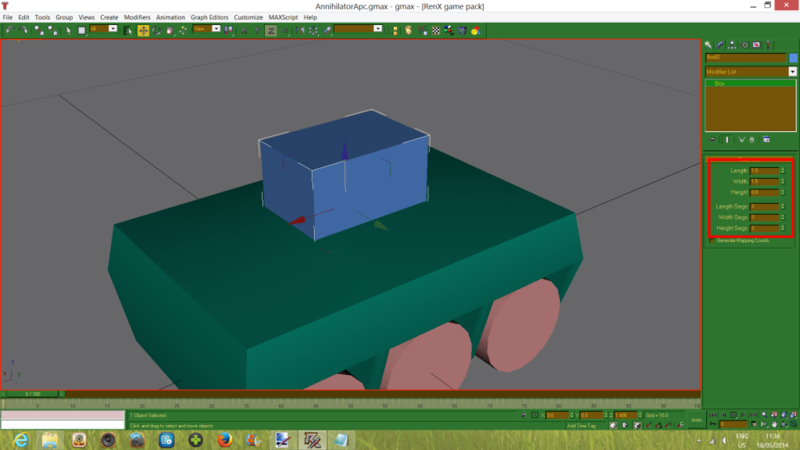 Next, resize the box and give it an ammount of segs you feel you need in order to model the turret. I used 3 segs for length, width and height. My values are indicated in the second screenie. 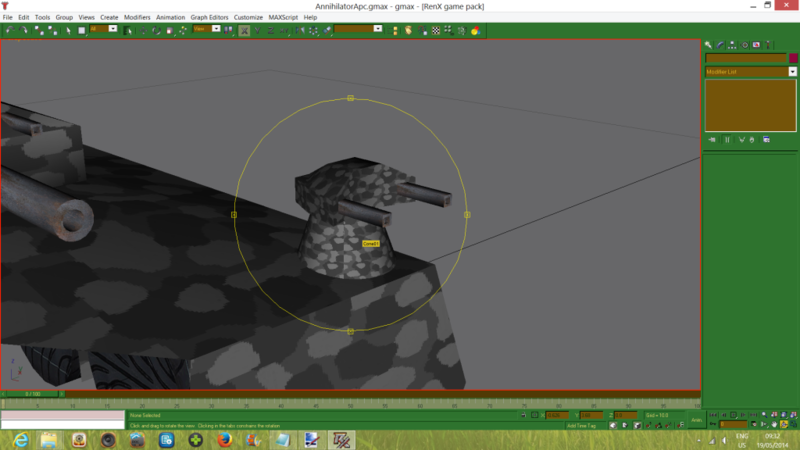 Next convert your turret to editabe mesh. Right click, convert to -> convert to editable mesh. 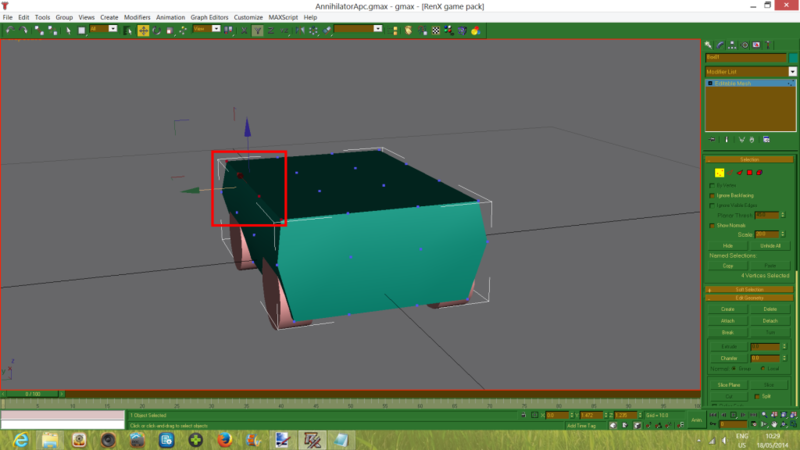 Select vertex again and lets start shaping the box to our needs. 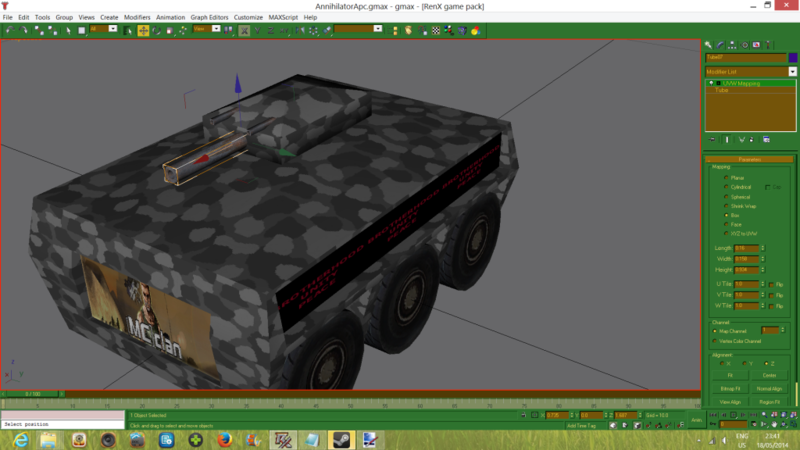 For my vehicle's turret I start off by cramping together the bottom vertexes as seen on the second last screenie below. Be sure to switch to wireframe mode (F3) for an easier time moving and selecting vertexes. 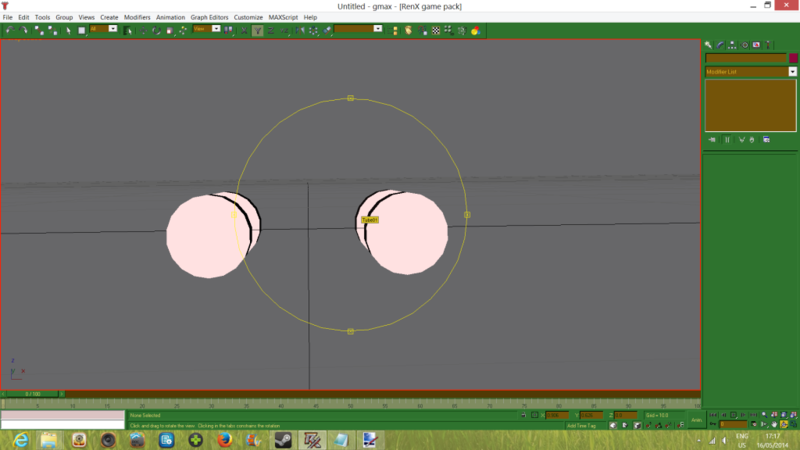 First i move the front and back lower vertexes closer, then the side ones. I copy the x or Y co-ordinates again to make sure everything stays lined up. Next we will do the same for the top vertexes on the front and back line. And after that the sides again. After this we will select all vertexes above the bottom ones and drag them down a bit. Lastly, we will select only the top ones and drag those down a bit as well. End result below. Now we just need to make the barrels. You can use either a box or a cylinder/tube. Cylinders/tubes are better for cannons while boxes are generally better for machine gun like weapons. I will be using tubes for this vehicle. Create a tube. Reduce the sides to 4 to turn the tube into a box. 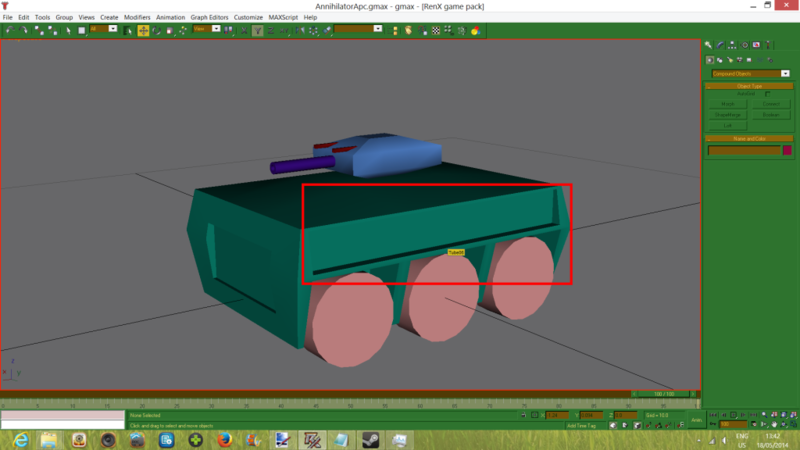 You will have to make these "boxes" really small for them to be plausible as machine gun barrels. The next screenie shows you the final size and position of my barrels as well as that I have cloned it to make 2 machine gun barrels. Also, make sure the segs are back to 1 here. We dont need any unnecesary vertexes here. The rotation might be a bit tricky too get precise, but it should not take very long. You do not have to make this many barrels. One machine gun barrel or 1 tank barrel will suffice. Also, only the main barrel will actually end being called barrel. In my case the machine gun barrels are secondary (fake, might be a better name). 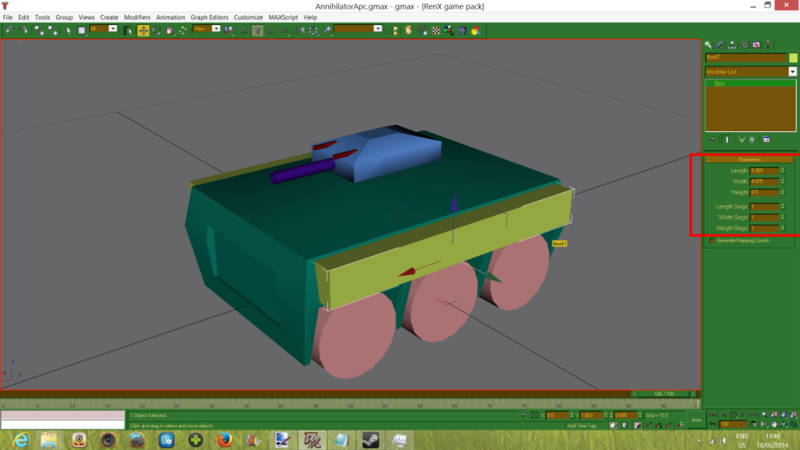 My APC's (yep, that is what I am making) main barrel will be a tank cannon, which I will setup as light tank cannon later on in LE. The benefit of a tube over a cylinder or box is that you do not have to make an inner barrel yourself. So next I create a tube which I rotate with Y 90. 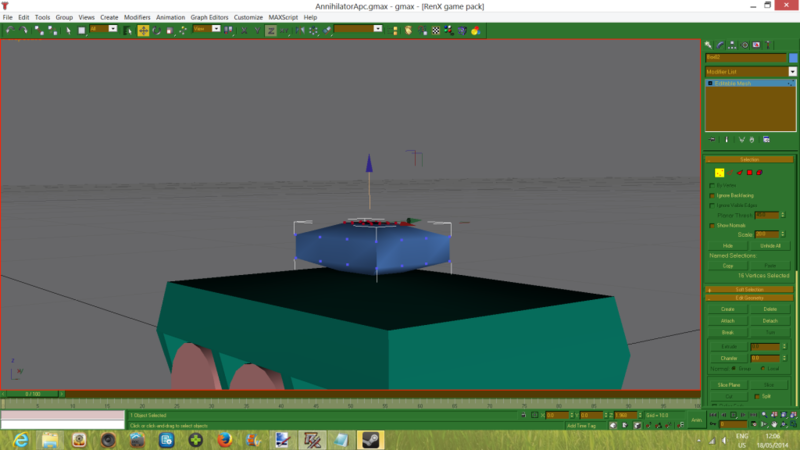 Then I size and position it so that it ends up as on the screenie below. Next create a small cylinder which you also rotate to match the barrel and resize it to match the barrel as well. Place this inside the main barrel before the body of the turret. The reason we do this is to avoid seeing the (later on) textured turret when we look through the barrel ingame. 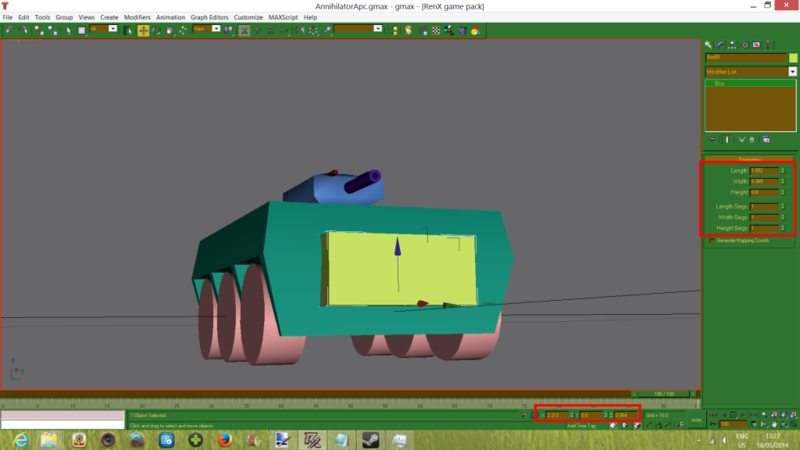 Something I had not done yet with my GDI heavy tank test vehicle. 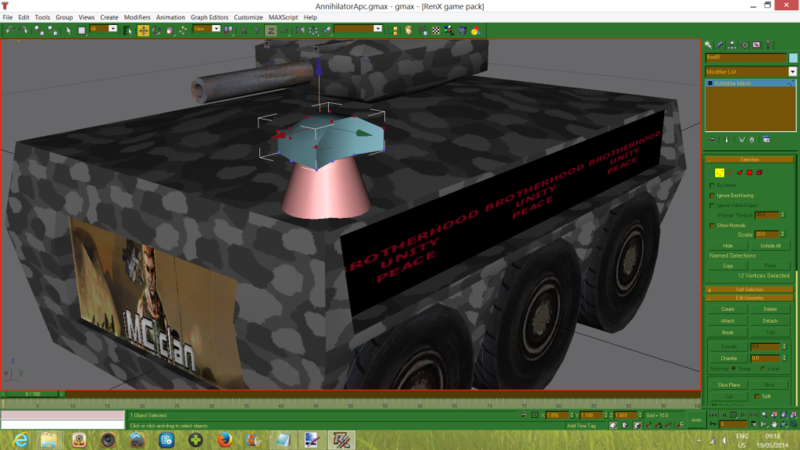 You can see in that vid that you can see the turret dome texture through the barrels. This might be just a detail but it does make it look better imo. 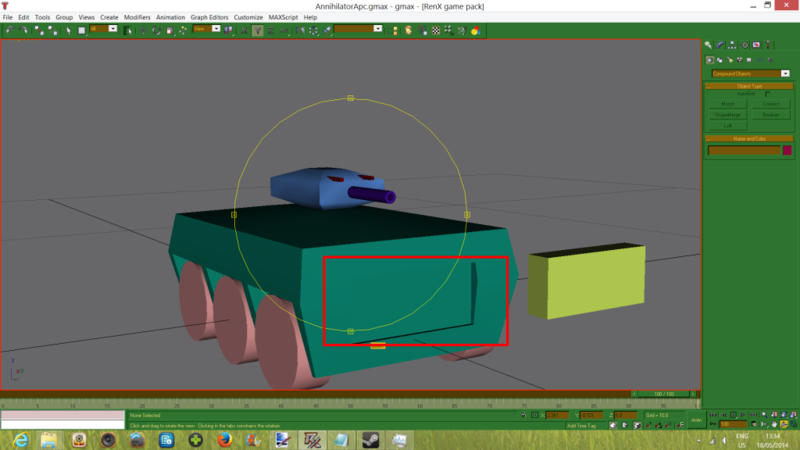 Now we do not NEED to do this for the smaller machine gun barrels, since they are really small and you would have to be looking for it specifically to notice it, but I am going to put small boxes inside the barrels anyway so that you do not see the textured turret through the machine gun barrels. Now we are done with modelling all necesary things. The barrels do not NEED inner barrels for them to work and they do not need small items to be put in them so you do not see the textured turret through them. These were already details we worked on. They are necesary imo if you want your barrels to look good. Now there are more details or other things you can add to your model. How about an area for a logo? 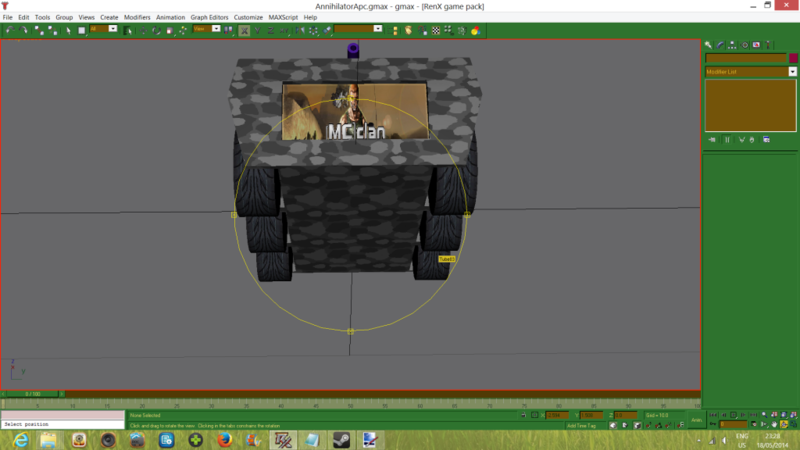 In this case it will be a MC logo (you can use a NOD or GDI logo texture instead). The texturing wont be till a little later (after all the modeling is done), so we are going to make a little space for it. You could make a smalle box and put it just inside the chassis. As long as it is big enough so that it sticks out you could make it look like a loose plate with a poster on it for the logo. Due to how my vehicle is shaped, this is however not that handy. Instead I will cut out room for it with boolean and then detach the new area. Let's make a small box for this. You can see the size and position of my box in below screenie. 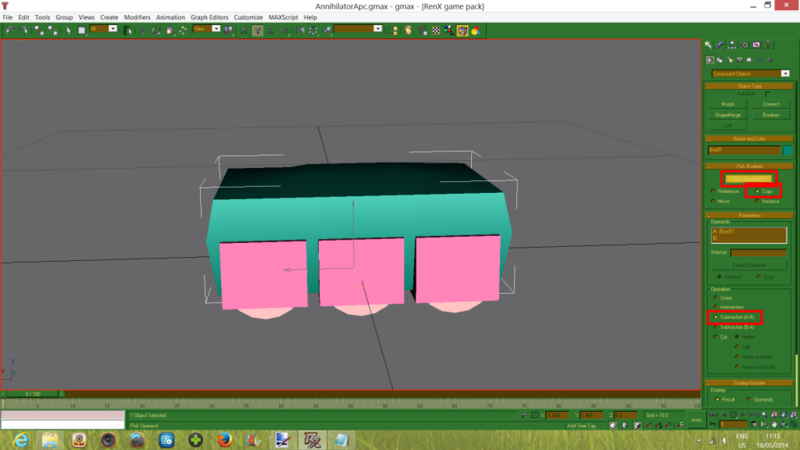 I have mirrored it with a second box at the rear end of the vehicle as well (cloned it). Since I will also be making some detail work on the side I have cloned it a third time so that I do not have to make another box. 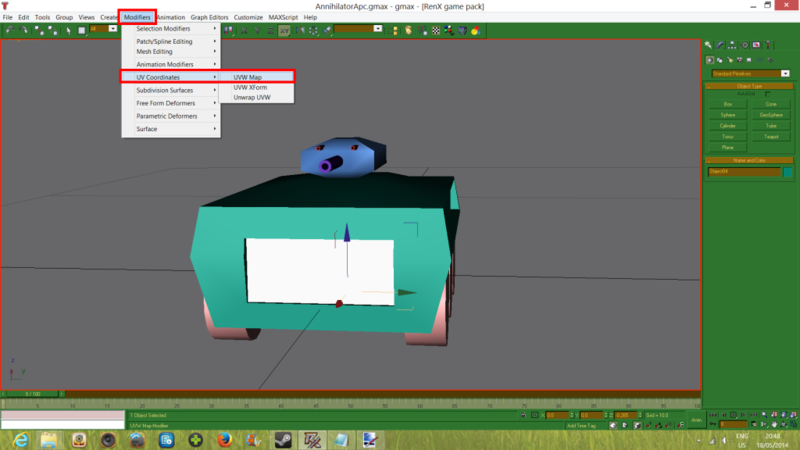 Now, select the chassis and click on the boolean icon. Make sure copy is selected and click on pick operand B. Next click on the box we just made in front. Click select and move so you regain control over the scene. Select the box and delete it. You will now see the indentation on the front side. Next, rinse and repeat for the rear side. Now I take the extra cloned box I have left over and reposition and resize it at the side. Then I clone it and move the clone to the other side. Then we do boolean again. Select the chassis, click on the boolean icon, make sure copy is selected and click on Pick Operand B. Click on the box and then click on the select and move tool again. Now select the box and delete it. Rinse and repeat on the other side. convert to editable mesh. 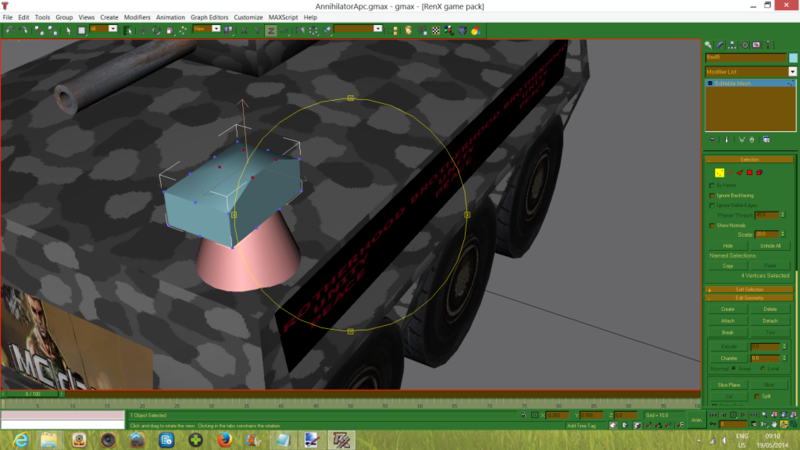 On the modifier tab click on polygon, then click on the area inside the indentation. It can help using wireframe (F3) here and clicking on the line of the surface (it can be done without though). You can see the surface I have selected on the screenie below. Once you have made sure you have the right one selected (move it back and forth a bit, and then click undo), you click on detach. A menu will pop-up. The default settings here are fine, and the name does not yet matter either so just click OK.
You will notice the red selection is gone. The object has been detached and is no longer a part of the chassis object. You will want to detach before texturing, because if you texture, objects you detach will share the texture, and changing either the detached object's texture or the texture of the object it was detached from will affect BOTH textures in that case. Now then, let's detach the other 3 indented back surfaces as well. Once you are done click on polygon again and then inside the scene. You can now select the objects you detached and move them around to double check that you detached the right objects. Be sure to undo the change right after, so that you do not have to manually reposition it. Well that is all for the modelling in this model. There are more details that can be added such as exhausts or flags or antennea etc. But I will not be doing so for this vehicle. The next and final step before boning will be texturing. 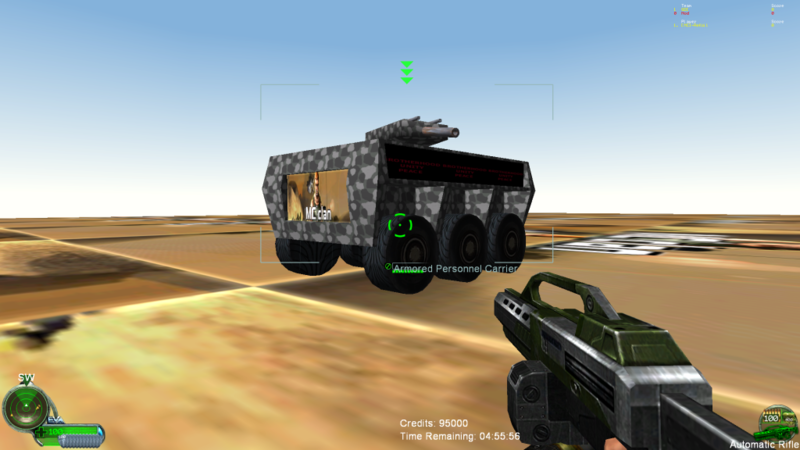 The default texture pack you can download is somewhat limited, but you can still make decent looking vehicles with it. To texture click on a part of your vehicle and hit 'M' on your keyboard. 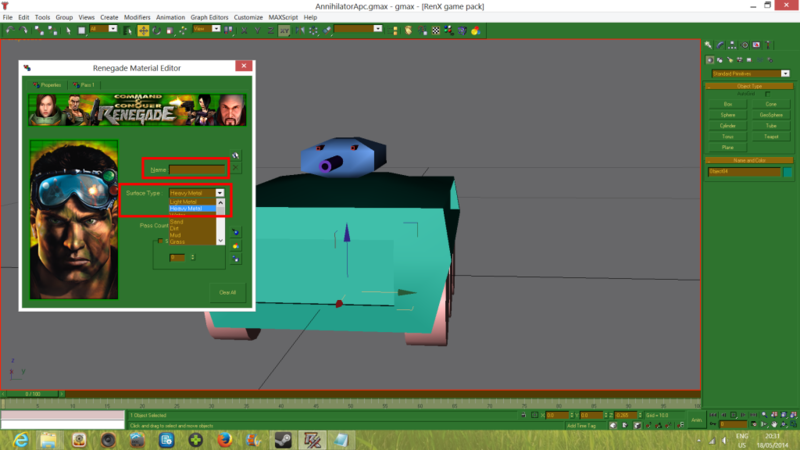 This will open the Renegade Material Editor. It opens on the properties tab by default. 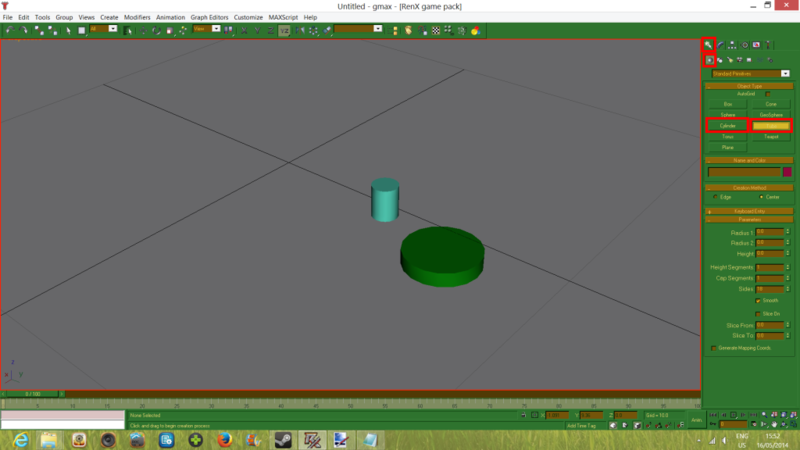 Here you wil set the surface type and a name if you wish. You can also increase the pass count, but this is not necesary for most textures. You do not have to fill in a name, and if you do not, it will automatically name the material something. The surface type is what dictates what the effect should be when the material gets shot. Since we are making a vehicle the Light and Heavy Metal will fit best. I am picking Heavy Metal for this vehicle. Next, click on Pass 1 at the top. 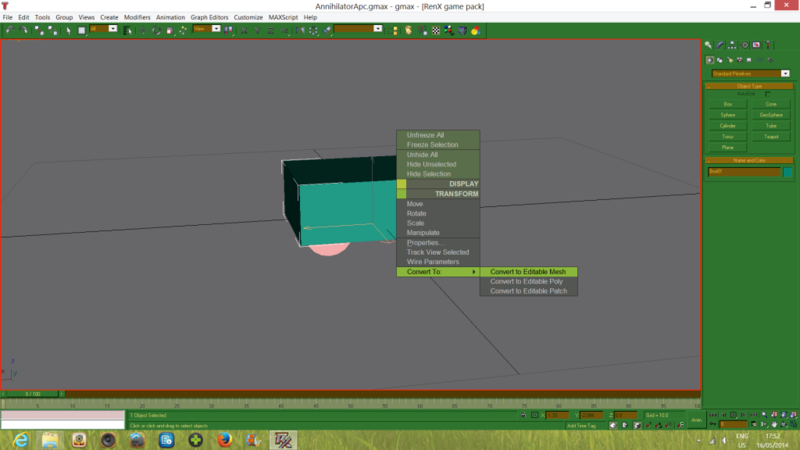 This will open the Vertex Material tab by default. We only need this tab and the Shader tab for more advanced effects, which are generally terrain related. We do not absolutely need them for a vehicle. Go to the textures tab instead. On this tab check the box next to Stage 0 texture. Then click on Display and then click on None. This will bring up a file browser like window to search for your texture files. 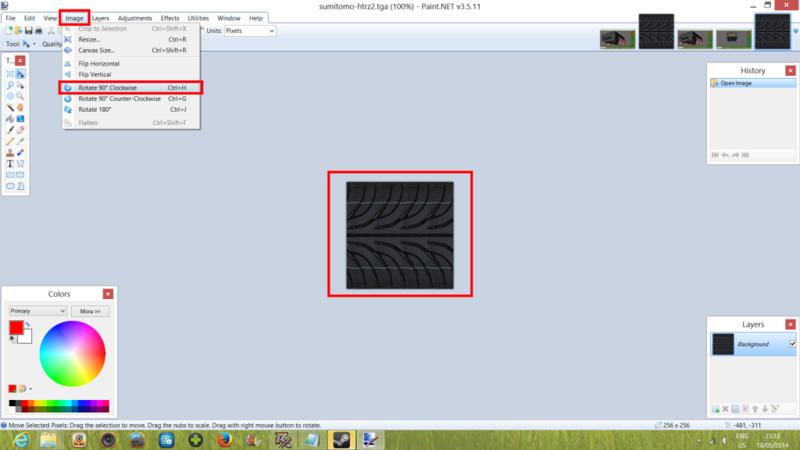 Go to wherever your textures are located, select one and click Open. It is handy if you copy paste all your textures into the main LE folder, since you need to have them there anyway for them to show up in LE. I browsed to my LE folder and selected a texture, and clicked open. 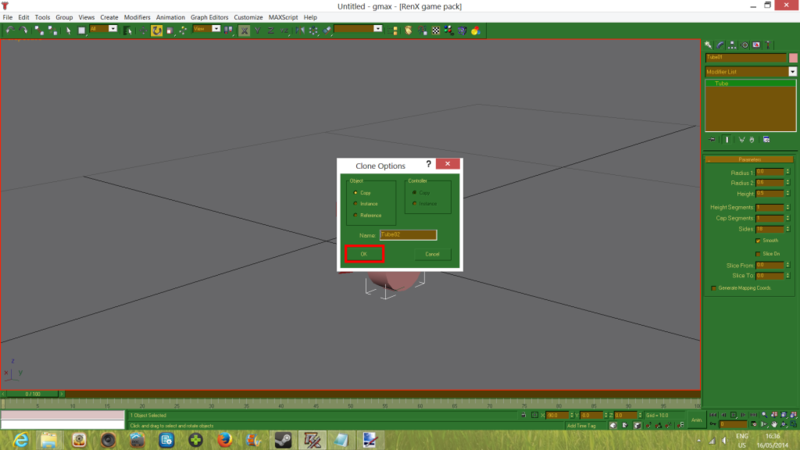 Next click assign material to selection and close the material editor. You will notice your texture is not looking right yet. (It is in my case because I had originally set it up with a different texture, but it was not looking right (the texture image itsself was messy). 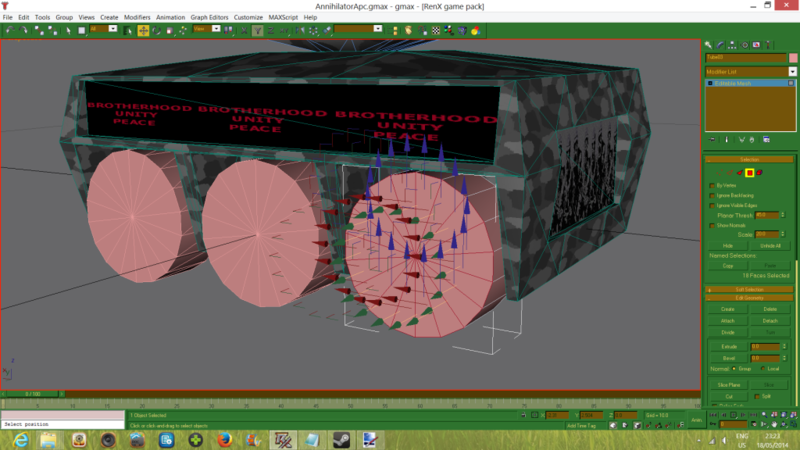 We need to make an UVW Modifier on the texture next. Click on Modifier -> UV Coordinates -> UVW Map. Now you will need to edit its settings so that the texture looks good. Make sure to put the mapping on Box (this one fits best on most objects imo). Try to make the UVW map modifier fit as you like the texture the best. It does not matter much on a relatively small vehicle model, but on big terrains for example you will not want to make the UVW Map too big though. If it still does not show the texture on one of the sides, make sure that every side has a value of at least 0.1 or higher. 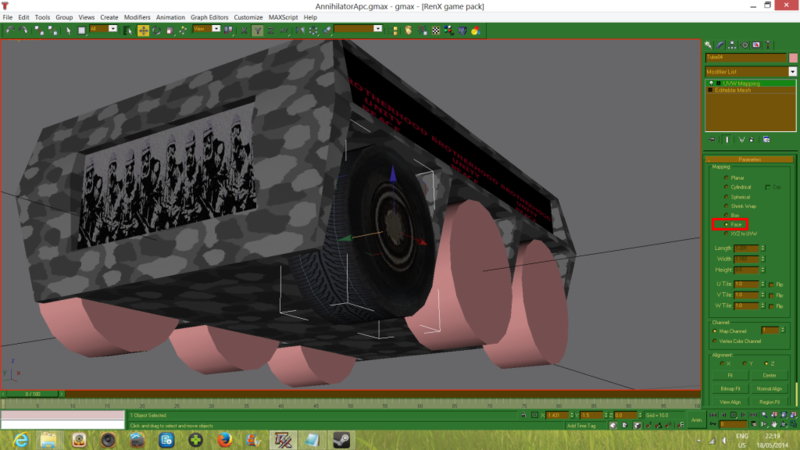 Now texturing the wheel nicely is going to take some effort. You will want to firstly detach the side that is facing outward. You do this like before. Convert to editable mesh, select polygon, and select all of them that make up the front as on the first screenie below. After detaching the front, texture it with v_tire_heavy2.tga and UVW Map it. I ripped this one from the always.dat from a .dds file. You can do this yourself too with XCC mixer if you wish. 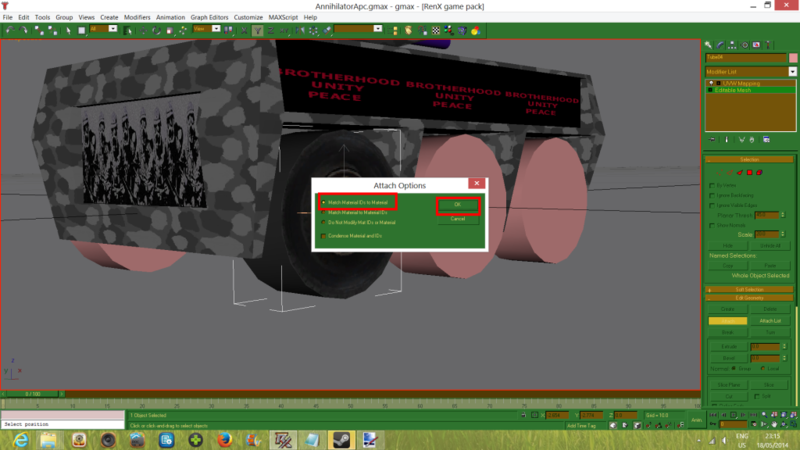 Next I apply the sumitomo-htrz2.tga (this I downloaded from someone (so do not credit me for it), I will again only provide the link, not the file: http://www.gtapex.co...php?topic=486.0) to the tire itsself and set UVW map to Box as before. In the modelling59 image you will see face instead of box. Ignore this. Face was from a previous setup, which when attached to the box UVW modifer of the front plate, the tire texture of the wheel would then still look ugly. So ignore it. Use Box. UVW Map). I used Paint.net, in which it is pretty easy. Just open up the texture file you downloaded, go to image and click Rotate 90 degrees Clockwise. Then resave it as .tga and put it in your LE and mod folders again. You might need to re-apply the texture material for RenX to update. Now either rinse and repeat this for all tires, OR clone it and use the coordinates of the wheels already in place to more quickly place them. Either way you will have to re-attach the front again. 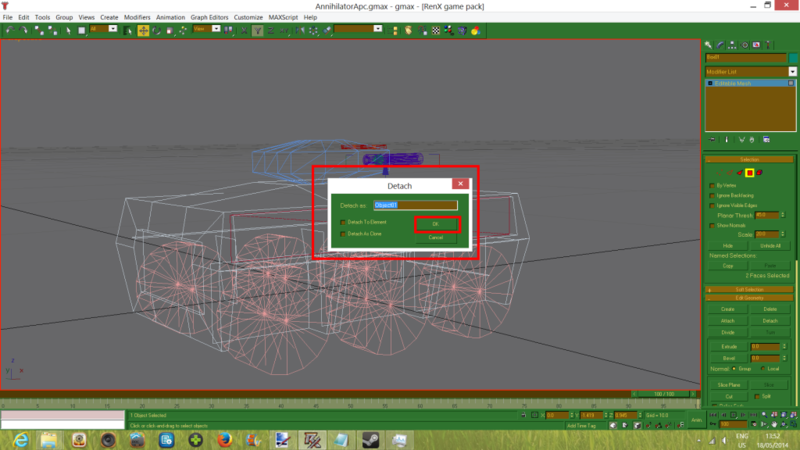 Click the tire itsself and go to the modify tab again and go to editable mesh. Click attach and click the front cap. A menu will pop-up. The default/top option here is fine. Click OK. Click attach again to unselect it and click on UVW map modifier again to see your texture properly again. Voila! 1 wheel done and looking good. I'm going to be lazy and just clone the wheel and copy the x and/or Y co-ordinates of the other wheels. And of course delete the old untextured wheels. I will do this for the side I am currently on. For the other side I either need to rotate the wheel (or just detach both sides in the first place), OR do 1 of the wheels again and clone for the other two . I will do the latter. Same process as above. Also, you might want to use F4 for the process of selecting the wheel polygons, its a tad easier to see than F3 in this case. 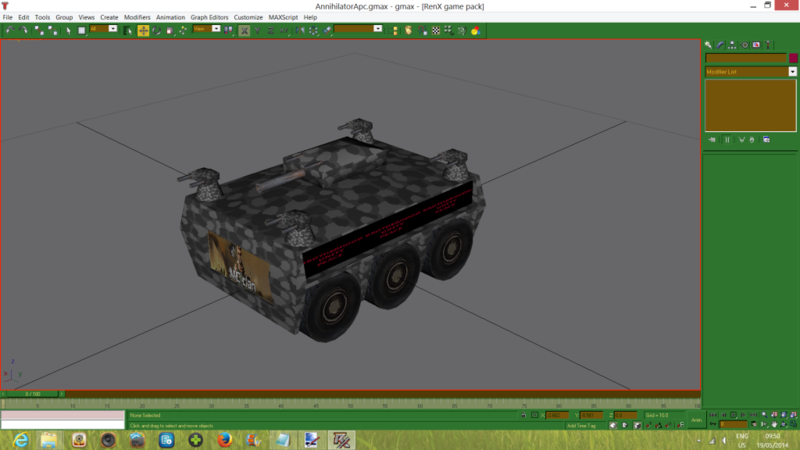 Phew, almost done with modelling and texturing now. 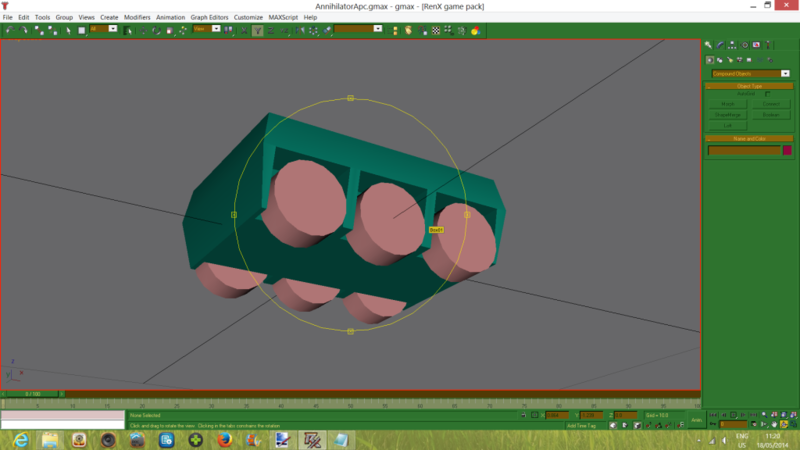 We only need to texture the barrels. For tank barrels I like using metpipe.tga since it generally fits pretty good. Apply the texture to all barrels and UVW map them. Below is my final end result. Note: If you have not noted down which textures you have used so far just select each and every object in your scene and go to the material texture tab to see which ones you used. I would recommend either making a note of which ones you used and then later copy those into both LE AND your mod folder, or just do it immediately as you are texturing (I do it the latter way). You need to put textures you use in your LE folder in order to have them show up in LE. You need to put textures in your mod folder in order for them to show up when you actually play your map. If you do not copy textures to these places you WILL see giant white WestWood error textures (you do not want that, trust me). Go to the next tutorial in this series to start boning your vehicle, or follow me below to model and texture some additional turrets (these will be needed if you intend to also follow the multi turret setup tutorial, after all, you NEED some turret models to set up as additional turrets ^^). Do not do this if you do not want additional turrets. You can use multiple primitives for turrets. 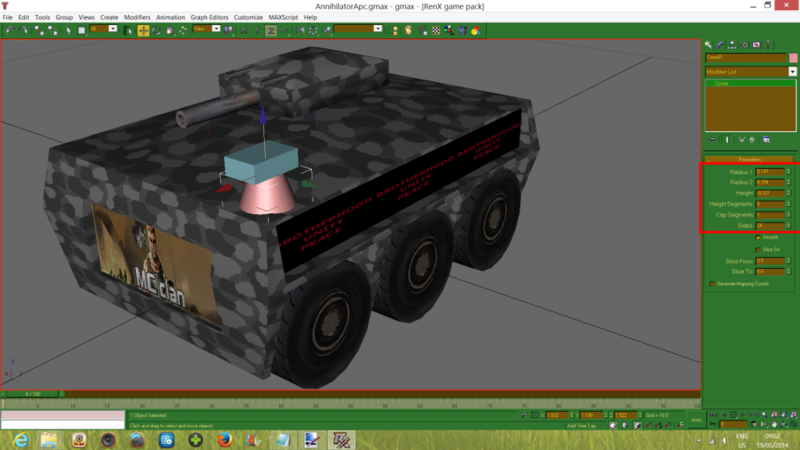 The easiest is the sphere, which I used for my GDI heavy tank test vehicle. Stick a couple of barrels in it and you are done. For this vehicle however, I will be using a cone and a box. The below screenies have their sizes. 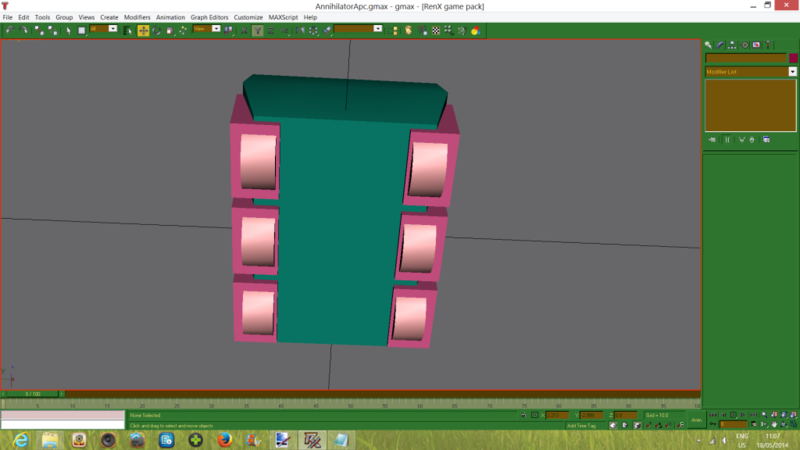 I also gave the box 3 width segs and 2 length segs. 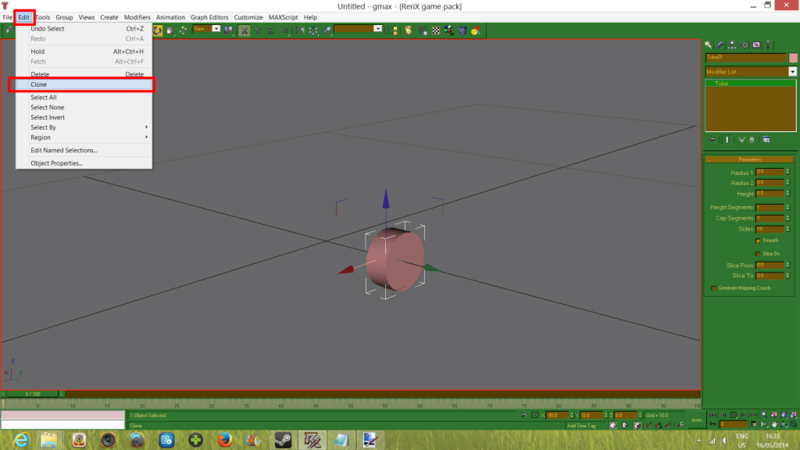 Now, convert the box to editable mesh and drag it's vertexes as you wish. In my case I drag the rightmost 4 vertexes of the middle rows on top and move them up a bit. 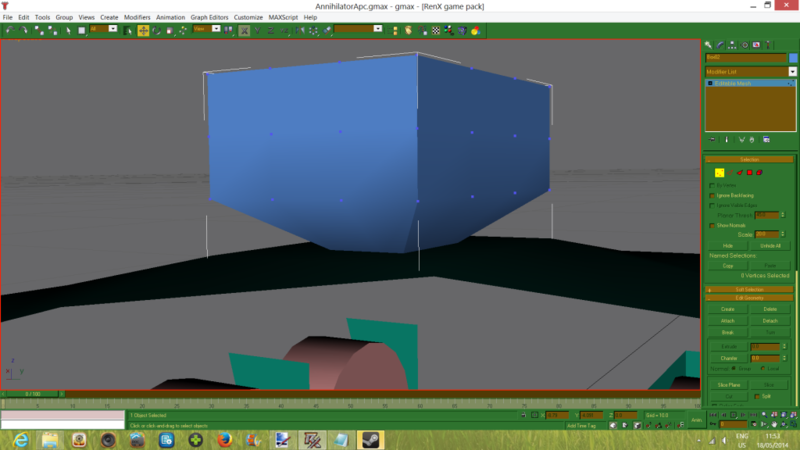 Then I move the top and lower outer vertexes away a bit. 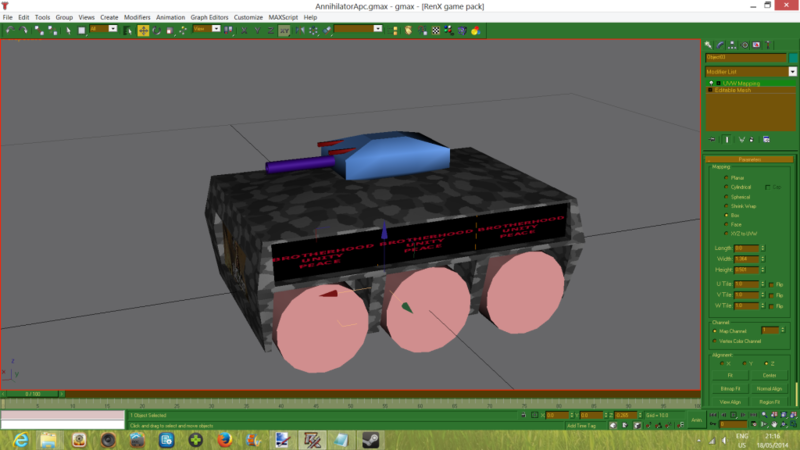 Next I move the middle outer vertexes on the side towards the turret a bit, followed by the ones on the rear of the turret. Then I select all upper vertexes and pull them down a bit. End result below. Next I rotate the top part to be looking forward. Next, we will texture it. And finally we will clone the smaller barrels I had made for the main vehicle as I want my additional turret to also fire bullets. Be sure to also clone the small blockers we put in the barrels. Line up the barrels and blockers where you want them on your additional turret. I know the small blockers are not textured; we will be attaching these to the barrels later on (untextured objects that get attached inherit the texture of what they are attached to). End result below. 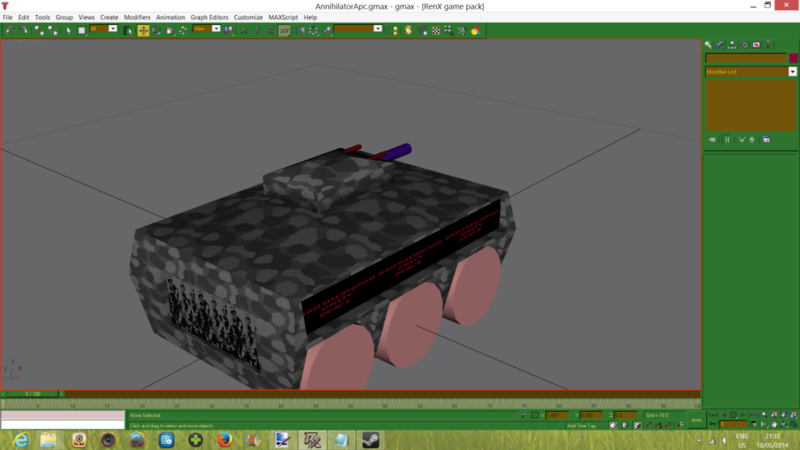 Now you can model different turrets for the same vehicle, but for the one I am making, four of these will suffice. So I will be cloning it 3 times and moving the clones to the other corners of the vehicle. Final result also below. Make sure you select all the objects when cloning. It was 6 objects for me (barrel x 2 + blocker x 2 + cone + box).